Employee attritions, terminations are a fact of life in every organisation and positive attrition is good to maintain a fluid workforce. Medium attrition due to staff turnover is positive as it brings fresh blood and ideas into the organisation avoiding ‘stale’ situations whilst maintaining skills, knowledge and experience necessary to maintain consistency of performance. High attrition due to staff turnover can be harmful. In most cases the high turnover is made up of staff normally within 1-3 years of their commencement with the business meaning that fresh blood, ideas and different experiences are leaving and only long service employees ingrained within the business remain. Normally this indicates potential issues at the core of the business. Terminations due to performance, behavioural or redundancy situations must also be handled in an appropriate manner. In order to be successful when terminating employees contracts for any reason this should be carried out objectively, dispassionately and professionally. Particularly when dealing with redundancies this should be carried out with empathy. We have many years of handling attrition issues within organisations. We can help you look at your staff turnover rate giving you a health check to identify if it is too low, about right or too high. Too low we can talk about potential strategies to resolve the issue. Too high we can investigate looking at business data and conducting exit interviews, staff satisfaction questionnaires etc. We also have many years’ experience dealing with terminations of all types. Often it is good to involve external HR consultants even if you have your own internal HR, especially when you have a relatively small organisation. 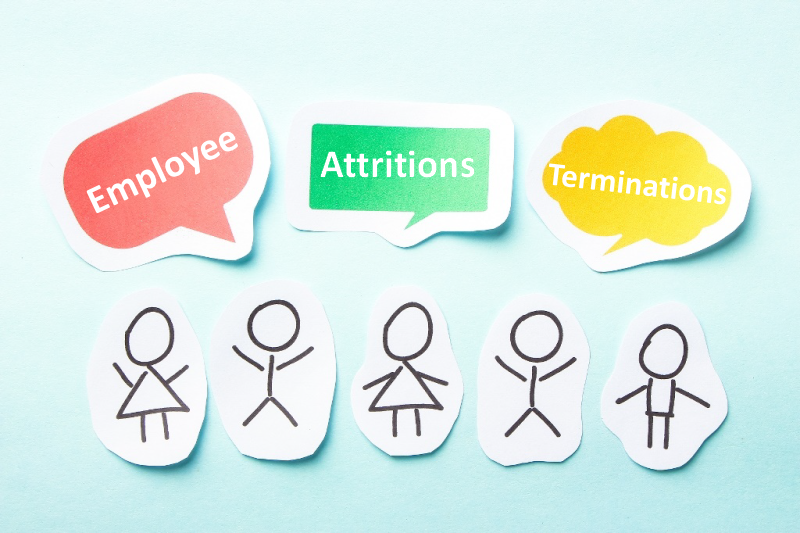 Let us help and guide you through the myriad of difficulties and legal requirements that are involved in attrition and terminations.